Consider giving the gift of smoothies to a new mom, a friend recovering from oral surgery, or a harried neighbor. 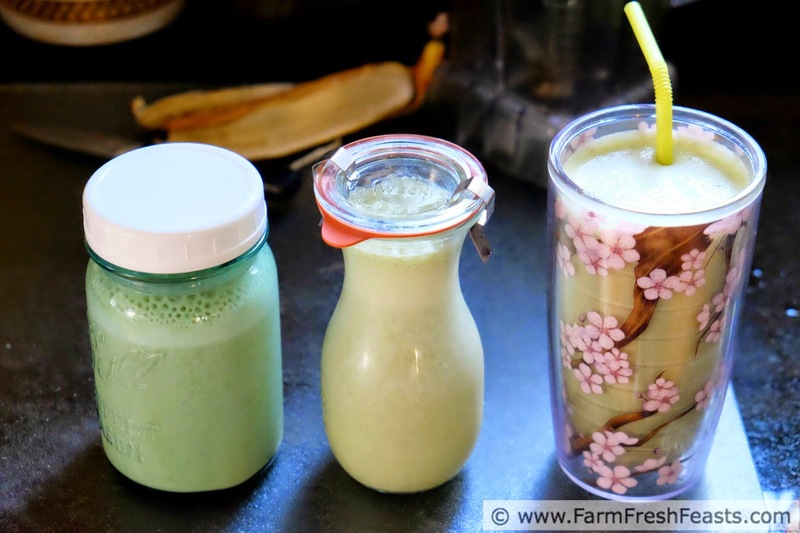 Ready to shake up and drink, smoothies are a fast way to get some nutrition and get back to business--be that bonding, healing, or caregiving. Motherhood equals nurturing (no, you don't have to have created/raised offspring to read on--we've all had moms). One way folks nurture is via food [hello, nurture and nutrition share the same root]. Taking meals to a new mom is one way of nurturing the new family as they become a unit. Taking a meal to a mom after her 6th kid is just plain nurturing for her [though watching the kids and doing her laundry so she can get a massage is even better but doesn't fit with my theme for today's recipe]. What about other folks who need nurturing? A busy friend caring for aging parents? A neighbor caring for his ailing wife? Someone recovering from oral surgery? It's the last situation that inspired today's post, but the more I though about it the more I think this concept would work for a variety of circumstances. Smoothies keep for several days, and it's easy to scale up a recipe to make an extra portion. With that in mind, when I found out my friend wouldn't be eating solid food for quite some time after her tonsillectomy, I offered to bring her some smoothies. I was going to be near her home on post-op day #5 and that seemed like a good time to deliver as she'd be coming out of the initial post-op haze. 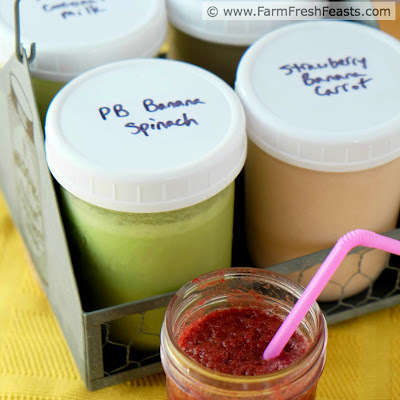 With a delivery time set, I worked backwards making a smoothie or two a day so that I had a nice assortment. I delivered on Cinco de Mayo and I even included a little Cheater Margarita Smoothie since she was off all her narcotics. The one aspect of post-op recovery I didn't think about until I arrived at my friend's house [and the RN in me woke up and asked after her bowels] was pooping. I should have made a smoothie with some prunes. Yes, putting the whole fruit into the blender does mean that my smoothies do have fiber, but I could have gone a bit further. The next day I tried my hand at making a Peanut Butter & Prune smoothie for our after school snack. 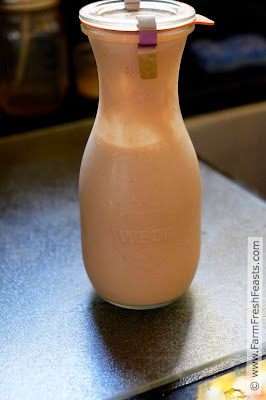 The kids drank it up because it was sweet and creamy, so add that to your repertoire for new moms and recovering friends. Robert Barker did not sample the peanut butter and prune smoothie. He sampled my hostas, though. I used my Vitamix (Amazon affiliate link) to make the smoothies, the same as I've done since 2001 or so when I bought it in Hawaii. We found that our preschooler would not eat vegetables or fruits, but he'd drink them, and we spent a lot of money at Jamba Juice before buying a Vitamix at the base exchange. I've used this machine often throughout the last 14 yrs and have recommended it to others. Check out Costco to purchase, though, as that may be a better deal. As you can see, the smoothies settle out soon after blending. Simply shake it up and you're ready to drink. I've not kept smoothies more than 4 days, but on day 4 the taste was just fine. I do like to add vegetables to most of my smoothies. It's a terrific way to use greens from the Community Supported Agriculture (CSA) farm share--even long-frozen greens put up in a fit of greens paralysis last year. I delivered the smoothies in pint canning jars [in a cooler, though I did display them in this adorable canning jar tote from my thrift shop] because this is the time of year that my canning jars are all sitting empty. Any recycled jar would do very well for this purpose. I'm a big fan of these canning jar plastic storage caps (Amazon Affiliate Link) . 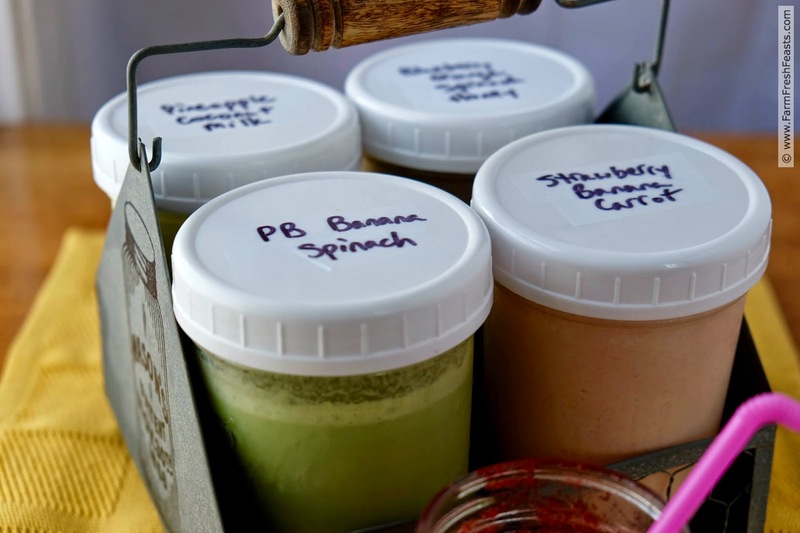 They extend the usefulness of my canning jars--in the freezer, in the pantry with dry goods, and in the fridge with opened jars of jam. If there's not alcohol in a smoothie, I don't measure anything out and can't provide an extensive recipe, I just dump the ingredients in the order listed, slowly start the blender, and finish it up on full power until the little bits (of blueberry or spinach) look small enough to me. I'll just give you lists of ingredients for the various smoothies I brought to my friend, and for the peanut butter and prune smoothie I made afterwards. 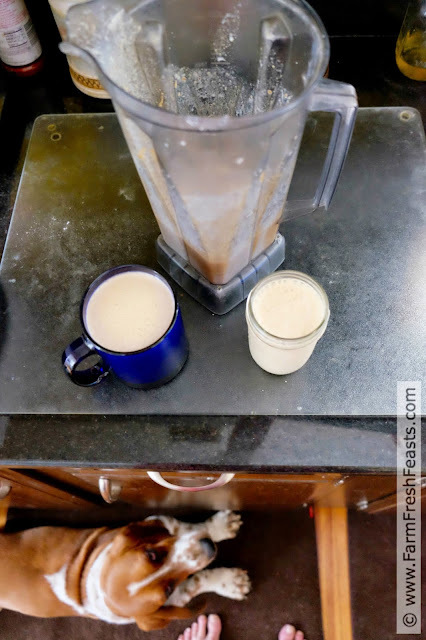 My Peanut Butter & Banana Smoothie was inspired by Meghan's Peanut Butter Chocolate Smoothie but I didn't have most of the stuff so I went rogue. in the two years of caring for Dad recently, I would make fresh juice each morning and drive it up the hill to his house, he loved it, even when it was green! this is such a thoughtful and nourishing idea, and I love your variations! What a wonderful gift for your dad to receive and for you to be able to do for him. I have been thinking about joining the smoothie bandwagon, would you recommend a Vitamix? You'll love this bandwagon! I don't usually go for smoothies in the dead of winter (I switch to oatmeal then) but the rest of the year I can go for a smoothie. 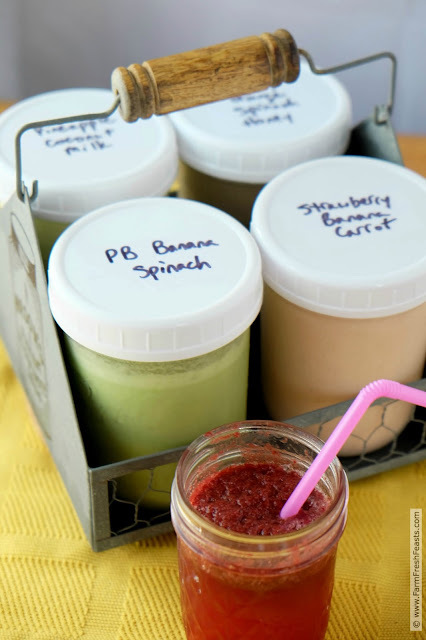 When we're all hungry and dinner's not yet ready, a pitcher of smoothies can tide us over. I would absolutely recommend a Vitamix. I have used mine year round, in 4 kitchens over the last 14 or so years. It runs great. They cost more initially, but you don't need to buy a new one in 4-5 years so to me that's a better deal. Best of luck with your research and shopping! If you hit up Costco, watching the person demo how to make a smoothie + reading the cookbook was more than enough to get me started. Such a great idea, Kirsten.....if only my mum wasn't so damn picky! I'd probably end up getting annoyed and giving her a bottle of water. I would, however, make this for myself. Perhaps if you call it a Persian Smoothie your mom would approve? Keep your smoothies for yourself if not, or find another friend who would benefit from a little easy nutrition boost. We are on the road for Mother's Day--looking at houses!!!! So a smoothie on the go, is perfect for me this year! House hunting--how exciting! I still can't believe we pulled up in this town on a Sunday afternoon, hit some open houses, met with the Realtor Monday and Tuesday morning and put an offer on one of the 12 we'd seen on Wednesday. And now, 4 years later, for Mother's Day I'm painting the half bath and helping my spouse install a new sink and toilet. If we have it all done by Sunday night, I'll consider it a successful weekend. Oh, thank you so for sharing with your mom! She sounds like a smart lady--I take smoothies to work, too. I'm not a smoothie drink but my husband is! He always makes his ahead of time to just grab and go. I'm sure he'll love these combinations! 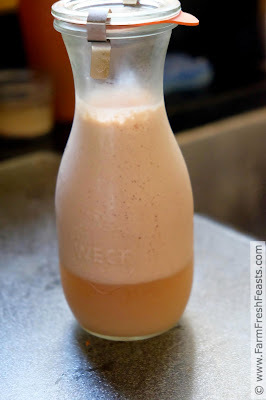 My spouse doesn't ever make smoothies, but is generally happy to drink whatever I've got. I've recently turned him onto the PB, Banana and Spinach combo. I do love the idea of this, especially since I often give food in times of need. The idea of sharing smoothies never crossed my mind before although it will now. I'm calling on you the next time I have oral surgery. I don't know if I can deliver to Cleveland. But if I can fit it into my schedule, I sure will. Schedule your oral surgery (if you must) for a sled hockey clinic and I'm in. Thanks for sharing that PB & Chocolate smoothie with me so I could empty the giant bag of frozen farm share mystery greens! I'm grabbing some of those lids! I was just contemplating taking smoothies on the go today and wondering how to transport them. Thanks. These lids rock. I first picked a bashed box of lids in the marked down section of the grocery store . . . gosh, more than 10 years ago. I had no idea what to do with them, but I can't resist the lure of a marked down Ball products so I bought it anyway. They are great for storing spiced nuts, wild violet sugar and other dry items. They are terrific in the freezer with stock (though if you open your freezer door and the jars go leaping out because the wire holding items to the door falls down . . . then they have a tendency to chip. But only in that instance. And the best use? Opening a jar of jam, then using a single piece lid to close it every time until the jar is empty. Love that. This is such a great idea! Perfect for busy moms! Exactly! 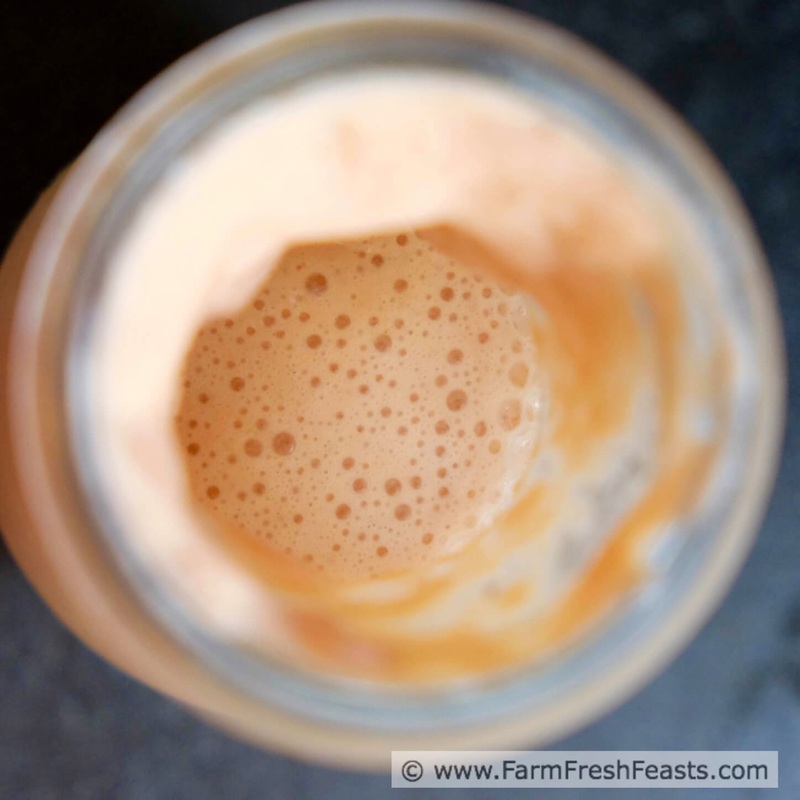 Blend once, enjoy a fast easy healthy boost all week long! Something that you can consume one handed, even.